Alright, let me just get this out of the way, first off: Gravity is really, really good, and you should all go watch it. Right now, if possible. I don't usually recommend this, but if you can watch it in IMAX 3D, do it. The 3D is totally worth it, and I really wish that I could have seen it in IMAX. The screen at the theater where I watched it wasn't nearly large enough. Trust me, it will help with immersion, not distract you from the movie. As a side note, the final shot in the movie is one of my favourite shots of all time. Just the cinematography behind it, it's so packed with meaning and purpose... the way the camera is placed, the direction that it's facing; it was clearly well thought out, and I truly appreciated it. 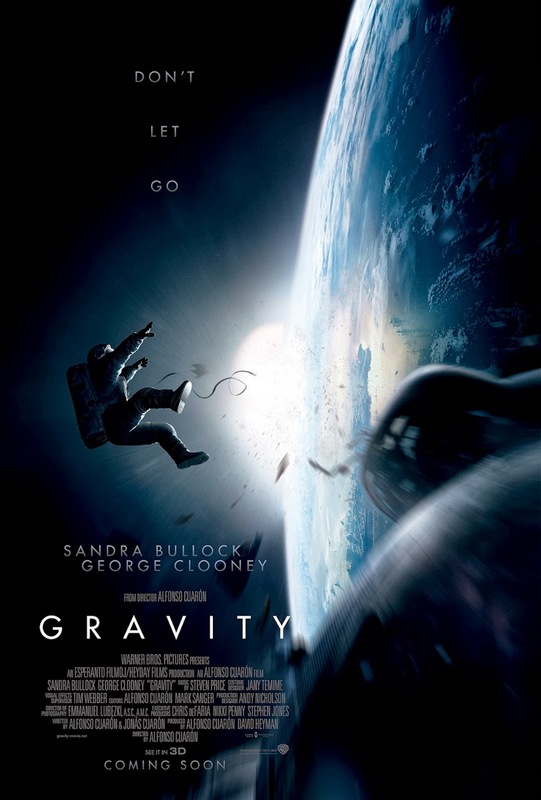 Moving on, let's talk about the plot of Gravity (without any spoilers or anything). The entire time that I was watching the movie, I couldn't help but be reminded of an anime that I watched freshman year: Planetes. Also 2001: A Space Odyssey, but I haven't actually watched that movie so I feel like I shouldn't make that comparison. Nevertheless, it's a movie that uses its space setting to explore the human condition, so I feel like that counts for something. The premise of Gravity is actually quite simple. A shuttle has been sent up to install a new module on the Hubble telescope. During their spacewalk, an accident occurs that results in the uncontrolled destruction of a satellite. Parts from the satellite scatter, colliding with other satellites at the same orbit in a chain reaction, creating a massive debris field that sweeps towards Hubble and the shuttle. The effects are disastrous, with the outcome being that the astronauts are effectively stranded without contact back down to Earth, and they must somehow survive. Planetes, on the other hand, is a bit more complicated (although given that it's a full 26 episodes, it makes sense). It's set in the near future, when there are major corporations that reside in space stations. A few years before the show starts, a passenger spaceship is struck by a stray bolt, killing almost everyone on board. To prevent this from happening again, all corporations are required to have a debris section, who are responsible for going out into space and cleaning up the garbage out there. The story follows a new hire in the debris section of Technora Corporation as she and her coworkers go about their job. It escalates from there, but that's the starting point. Just looking at the two summaries, you can see right away that a major link between the two is space debris. More specifically, both shows have an accident caused by space debris as a major plot point. When we launch rockets to get into space, the only way that we can get up to the required 11.7 km/s required to escape from Earth's gravity well is by using a lot of fuel. So much fuel that the rocket has multiple "stages" of fuel. When one stage runs out, it is disconnected from the rocket, and dropped as dead weight. If the rocket is already out of the atmosphere when it disconnects a stage, the rocket parts simply float up in space, orbiting the planet forever (or at least for a really long time). This is one of the causes of space debris (although, I will admit, not the most prevalent). A more common cause of space debris is simply leaving junk up there. We launch satellites, they eventually die, and then we can't bring them back so they stay up there in space, cluttering things up. According to the United States Strategic Command's Joint Functional Component Command for Space (through its Joint Space Operations Center), there are more than 16,000 pieces of space debris being currently tracked (as of December 2012). 87% of those are classified as "debris and/or inactive satellites." That's a lot of junk, and those are just the pieces that are large enough to be tracked (which is apparently around 10 cm). Now, 16,000 pieces of junk spread out around the entire planet is a pretty sparse covering, so the odds of hitting any of them are pretty low. But as we keep replacing the satellites that have died, the amount of debris will continue to grow. I don't think that it will ever reach the level of cover that is shown in the beginning of Wall-E, but it may get to the point where we have to do something about it in order to keep safely venturing outside of our atmosphere. Another thing that Gravity and Planetes have in common is a scene with someone drifting alone through space. Both are able to effectively capture the horror of being trapped somewhere unfamiliar and hostile to human life, away from everyone you know, and surrounded by darkness and silence. It's terrifying, checking your oxygen count as you float farther and farther away from safety, waiting for the moment when you will die. Do you have something to live for? Is there anything that can help you face the vastness of death? Both Gravity and Planetes have their own answers to this question that come from their respective cultures. Gravity, coming from an atheistic Western perspective stresses the importance of relationships and interaction between people. On the other hand, Planetes is a Japanese anime, so it ends up looking through an Eastern Pantheistic Monism perspective (also seen in Fullmetal Alchemist, where the mantra is "All is one, and one is all"). Personally, I don't subscribe to either of those worldviews. Being a Christian, I can face death because I have faith in God's plan for me and I know that I have been redeemed through the sacrifice of Jesus. If I were to have written either of these stories, I would definitely have that as the answer. Pulling back from that topic, it should be pretty evident that Gravity and Planetes complement each other quite well. After watching Gravity (which you're totally going to do now, right? ), I'd highly recommend that you check out Planetes. Unfortunately, it was sold in America by Bandai (who went under a few years ago), so it's kind of expensive to acquire now. However, Amazon does have it for sale here, so if you can, get it. If not, well, that's understandable. In related news, I think that I'm going to actually start buying some anime series on DVD soon. I've been enjoying series available for free (legal!) streaming for a while now, but since I enjoy anime so much, I figure that I should start giving them some real money so they can keep making it. Plus then I can show good series to friends, and actually watch the dubbed version (because only subtitled versions are free for some reason). Silly Funimation. Nevertheless, it's time to give back. A few months after I wrote this, the site Overthinking It featured a guest article by Marc Ziani de Ferranti that also draws the comparison between Gravity and Planetes because of their space debris, which I thought was interesting. You can check it out here if you're interested. Damn right!The first thing I got first in my mind was PLANETES! And how the Japanese people wer much more ahead of 'Muurican people in imagination!! Great analysis, I thought the same thing especially since Planetes is one of my favorite manga's. Gravity and Planetes both do a great job of putting that lonely hostile environment into perspective. It makes for great character development. Space debris getting dust from solid rocket motors, surface degradation products such as paint flakes.Impacts of these particles cause erosive damage, similar to the sandblasting.One of the major defense country Japan has started to thinking seriously about a militarized program focusing on space.Now, it's creating an entire militarized force to monitor and control the debris field from the ground.In this process US and Japaneese Governments agreed in May to work together on debris monitoring force.Let see how it works and the results are going to be.